Hook your Flash movie clips up to a database. So you've figured out the basics of the Flash toolbox, created your first tween, and added some wild animation to your Web site. You've built animation clips with fading reverbs, and created buttons which change shape as you mouse over them. And you're wondering what to do next. While there's a lot you can do with the tools Flash gives you, it's when you hook it up to the wild and wacky world of the Web that you truly begin to appreciate the power (and genius) of the application. Today's Web is built around dynamic, data-driven Web sites, and Flash, which comes with built-in capabilities to read data from a variety of data sources, is well-suited to it. The new data retrieval features in Macromedia Flash 5 (and better) allow developers to retrieve information from server-side databases and use this information to dynamically construct animation clips on the fly. As you might imagine, this opens up new possibilities for the creative Web developer, and sets the tone for a new generation of smart, dynamic and very cool Web applications. In this article, I'm going to give you a little preview, demonstrating how Flash can be hooked up to a MySQL database to dynamically construct database-driven animation clips. Most of these examples are fairly simple - you might even find them too simple - but they should serve as a gentle introduction to the new capabilities Flash gives you, and perhaps even help to answer that "what next?" question by sparking some ideas in that tangled web of neurons you call a brain. So strap yourself in tight - this is gonna be an exciting ride! Before we get started with building a database-driven animation clip, you need to know a little theory. The first - and most critical - thing you need to know is that there is never direct communication between Flash and a database. A Flash movie can never talk directly to a database server - there is always a third party involved. This third party takes care of building and transmitting the query from the movie to the database, and retrieving and massaging the results into a format that is usable by the movie clip. This third party's role is usually played by a server-side application such as Perl, PHP, ASP, ColdFusion et al. In order to better understand this, let's consider a simple example. Pop open Flash, create a new movie and then create a new Graphic symbol. Name it "message". Now, in the Symbol Editor, create a text box with the Text tool (hit A on the keyboard). Use the Window -> Panels -> Text Options panel to turn it into a dynamic, multi-line text box. While you're there, also set a variable name for the newly-minted dynamic text box - this is the variable that Flash will look for when the time comes to populate the text box. I've used the variable name "msg". Back in the Scene Editor, drag and drop a copy of your newly-created symbol onto the Stage. In the timeline, select the first frame (this should be a keyframe), right-click it and pop up the Actions dialog box. On the left-hand side of the Actions panel, look in the "Basic Actions" sub-category and select the loadVariables() function. This ActionScript function allows you to load variables into the Flash movie from an external URL - more on how this works later. The lower half of the Actions panel should prompt you to enter some parameters for this function - specifically, the URL to get the variables from. For the moment, let's assume that the variables will be loaded from the URL "message.txt" - specify this in the lower half of the panel, as shown below. msg=Welcome to the wonderful and wacky world of dynamic data sources! Obviously, this file should be stored in the same place as the Flash movie (you can store it elsewhere too, just remember to alter the URL supplied to loadVariables() appropriately). and watch in amazement as your Flash movie changes as well! Obviously, that was a very primitive example, though one that did demonstrate the concept of integrating data from an external source with a Flash movie. Now, how about a twist? Let's suppose I modify the Flash file above so that the call to loadVariables() loads variables from a server-side script ("message.php"), rather than a static text file. This should be fairly simple to understand, even if you've never programmed in PHP before. 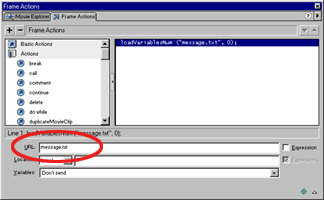 Very simply, I'm opening a connection to a MySQL database, running an SQL query to retrieve the contents of the "message" table, and displaying that content as form-encoded data. Any change to the database record will be immediately reflected in the Flash file - with zero changes required to the Flash source. In case you don't want to use a database as your data source, you can even run a shell command and send the output of the command to the Flash movie for display. Consider this variant of the script above, which displays the output of the "fortune" program (a new message every time) whenever the Flash movie is played back in your browser. Now, you can develop some pretty cool applications with power like this...and one of the coolest (and easiest) is a dynamic news ticker, updated from a MySQL database. Let's see how. 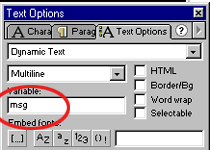 First, pop open a new Flash movie and create a dynamic text box symbol, in the manner described on the previous page. Call it "ticker", and name the variable which will contain the data for the text box "content". Format the appearance of the text box, by adjusting the values in the Window -> Panels -> Text Options and Window -> Panels -> Character dialog boxes. I used a white Arial font, size 12, right-aligned. Next, we need to create a motion tween to move the text box horizontally across the bottom of the movie. Insert an instance of the newly-minted "ticker" symbol into your movie clip, outside the lower right edge of your movie clip. Insert a new keyframe in your timeline somewhere around frame 40, and move the symbol instance all the way across to the other edge of the movie clip. Right-click anywhere between the two keyframes in the timeline and insert a motion tween. Test your movie. You should see the symbol instance float horizontally across the bottom of the screen. Of course, it doesn't contain anything yet - which makes it fairly useless. Let's rectify that next. Right-click the first keyframe and insert some ActionScript. This tells Flash to load variables generated by the server-side script "ticker.php" into the movie, and use them wherever required. Let's look at that script next. The script "ticker.php" needs to connect to this database and extract the five most recent records from it. This data can then be converted into form-encoded data and picked up by the Flash movie. Again, this is fairly simple. The script first connects to the database server, selects a database and executes an SQL query to select the five most recent stories from the system. A "while" loop is used to iterate over the returned resultset, with the content of each record appended to a single string, separated by an asterisk. Once the entire string has been constructed, it is encoded via PHP's urlencode() function and sent to the standard output, where it can be picked up by the Flash movie. With the server-side component in place, and the Flash movie all prepped and ready to go, all that's left is to test the movie again. This time, the text box should be dynamically populated with the results of the SQL queries in the script above, and should display this data as a scrolling news ticker along the bottom of the movie. As the database is updated with new stories, the Flash file will automatically read and display them via the server-side script "ticker.php". Pretty cool, huh? Another, more advanced example involves constructing a Flash menu dynamically, from the information in a database. This allows you to build menus that can grow and shrink automatically, as the information in the database changes, and it's a guaranteed entry into Flash geekdom. The process is fairly complicated, so let me run you through a quick theoretical overview before we get started. Most of the work here happens via an ActionScript function named duplicateMovieClip(), which makes it possible to programmatically clone a Flash movie clip symbol. So, if you had a single movie clip symbol, representing a single menu item, you could combine the duplicateMovieClip() function with a loop to spawn numerous copies of that single menu item, and thereby build an entire menu dynamically. This might seem a little far-fetched, but it works pretty well...as you'll see very shortly. First, though, let's get all the pieces together. Pop open Flash, create a new movie, and create a couple of new symbols. The first one is a graphic symbol containing a single-line dynamic text box - name the symbol "text" and the data variable "label". At a later stage, I'll be using ActionScript to set a value for this "label" variable. Name this button symbol "circle". In case you're wondering how I created this, it's fairly simple. In the Symbol Editor, use the Oval tool to create a hollow circle (remember to make the fill colour transparent to achieve the hollowed-out effect) for the Up state. Next, insert a new keyframe for the Over state, and place a smaller inner circle within the outer one. Make sure that this one has a fill colour (I've used red). Finally, create a movie clip symbol named "item". This symbol is what I'll be using to generate the menu items in my dynamic Flash menu. It should contain both a button (which the user can click to go to a specific URL) and a label (which describes the menu item). You've already created both these components; all you need to do is drag and drop them from the Library into the movie clip Symbol Editor. Yes, that's right - your movie clip symbol is made up of two other symbols. No, I'm not smoking a controlled substance - all will become clear shortly. At a later stage, I'll be using ActionScript to set a value for this "url" variable. At this point, your Library should contain three symbols - "text" (the label), "circle" (the button) and "item" (the container for both). Drag and drop an instance of the "item" symbol onto the Stage. Use the Modify -> Instance command to give this instance a name - I called mine "itemInstance". This name will be used to reference the instance when creating copies of it via the duplicateMovieClip() function. Right-click the first frame (this should be a keyframe), and add some ActionScript to it. This script does the hard work of connecting to the database, extracting the menu items and their corresponding links, and creating a URL-encoded string that Flash can use. It's important to note, at this point, the format in which the data is output. All the menu labels are compressed into a single string, separated by a pipe, and assigned to the variable "items", while all the corresponding URLs are similarly concatenated and assigned to the variable "urls". The onClipEvent(data) event handler is triggered whenever the Flash movie completes loading the variables imported via loadVariables(). This is necessary because Flash loads variables asynchronously, which means that it doesn't wait for the variables to be fully loaded before proceeding to the next statement of the script. By wrapping the code in an onClipEvent() handler, I'm ensuring that the it's executed only after the variables have finished loading. This doesn't always work as advertised, though - keep reading for a couple of caveats to this technique. and a "for" loop is used to iterate over the resulting arrays. This "for" loop does a number of important things. 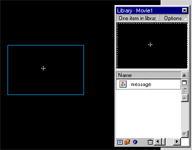 First, it creates a duplicate of the "itemInstance" movie clip, and gives it a unique name by suffixing the array index to the name. Next, it sets the vertical position of the newly-created movie clip, via the instance's "_y" property. This position is calculated via a simple algorithm, which allows each additional instance to be placed below the previous one. Finally, the movie clip's "label" and "url" values are set using the set() function; these values are used within the "text" and "circle" symbols respectively (you remember I mentioned these on the previous page). These two lines of code set the newly-created menu item's label and target URL respectively. This forces Flash to run the split-into-array-and-create-duplicate-instances code whenever the movie plays, instead of waiting for the event handler to be triggered. It's a somewhat brute-force solution to the problem - the first option is far safer, not to mention also being the one Macromedia recommends - which is why you should only use it if you find yourself in dire straits. And that's about all I have time for. In this article, I introduced you to data-driven Flash applications, demonstrating how you can use a database and a server-side script in combination with the new data retrieval capabilities in Flash 5 to dynamically construct Flash movies. I also showed you a couple of simple examples, including a database-driven Flash news ticker and a dynamically-constructed Flash menu. However, building Flash movies from a database is only the tip of the iceberg. Flash comes with a number of tools that allow you to add new types of interactivity to your movies, including creating forms capable of accepting user input and parsing XML data sources. I'll be discussing these capabilities in detail in upcoming articles - but until then, chew on these links, and I'll see you soon! This article was first published on 11 Jul 2002.